The purpose of this study was to explore the effects of yutori reforms on Opportunity to Learn (OTL), as defined by Stevens’ (1993, 1996) multidimensional framework, and to examine how the changes in OTL may have subsequently affected Japanese 8th graders’ mathematics achievement as measured by the Trends in Mathematics and Science Study (TIMSS). 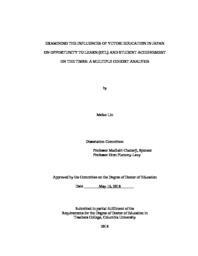 This dissertation was a mixed-methods, multicohort study combining analyses of archival documents and interview-based data with analyses of quantitative TIMSS data on OTL and student achievement in mathematics in selected years. The study used three waves of TIMSS data (1999, 2003, and 2007) to examine the effects of yutori reforms on OTL levels at the classroom level over time, and their corresponding influence on student achievement levels on the TIMSS assessment with Hierarchical Linear Models (HLM). The three overarching findings of this study were: (a) the yutori reforms were not implemented in schools and classes as originally intended by the Ministry of Education, Sports, Culture and Technology in Japan, with ongoing shifts in policies and priorities at the national level; (b) there were significant changes in classroom-level OTL measures indicating reductions in instructional time dedicated to mathematics but improvements in the quality of instructional delivery were found to occur under the yutori reforms; and (c) the instructional time component of OTL was found to be positively associated with students’ mathematics achievement under yutori reforms, with the most socioeconomically disadvantaged students benefitting more in terms of achievement outcomes than those who were more advantaged.